The overall length of the yellow streaked lory is about 12-1/2 inches. The coloration is generally green. The bill, skin at base of the tail and bare orbital skin is black. The lores and forehead to mid-crown are red, bordered blackish. The throat and breast have irregular red spots and patches with yellow or orange streaks on the mantle, breast, and belly. The thighs are red and the underwing coverts red with a yellow band across the underside of the flight feathers. The underside of the tail is light greenish-brown, basally red. The legs are dark gray. Immatures have reduced red on the head. 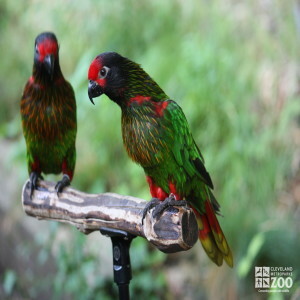 The range of the yellow streaked lory is the Aru Islands and southern New Guinea. The yellow streaked lory inhabits lowland savanna, lower mountain forest, secondary growth, sago swamps and mangrove, and coconut plantations. There is some seasonal movement, and populations of yellow streaked lories seem to be influenced by periodic blooming of certain trees. They are usually found in pairs or small parties, feeding on nectar and fruit. The wing-beat is shallow in flight, and they fly rather slowly. Pairs often engage in acrobatic flights. The voice is shrill. Both yellow streaked lory partners of a pair display to each other. The display can consist of neck arching, contracting of the pupils and simultaneously hissing through an open bill, also of bowing or moving the head in a vertical movement. Display can also consist of leaning toward one partner, often in front of the head, and then once again in the back and calling loudly.